How do I tell you what this thing feels like? When I was a child, we had a toy we called a “squishy ball.” It was filled with some kind of gel (I know because one occasionally leaked), and covered with a soft and comfy material. It was irresistibly fun to squish and squash. The Gelepad is like that, only flat and with a sticky side to keep it in place on a variety of surfaces. The adhesive is also reusable, in case you need to reposition or repurpose the pad. The Gelepad comes in oval and rectangular shapes, with the rectangle version being available in three different sizes. Its most obvious use is to pad armrests. Lots of office chairs have hard plastic ones by default; even the semi-soft ones can often use a bit more cushy factor, or perhaps a slight increase in height. Don’t want to get sticky on the arms of your expensive chair? There’s an accessory for that – essentially a flat piece of plastic with straps to wrap around stuff. 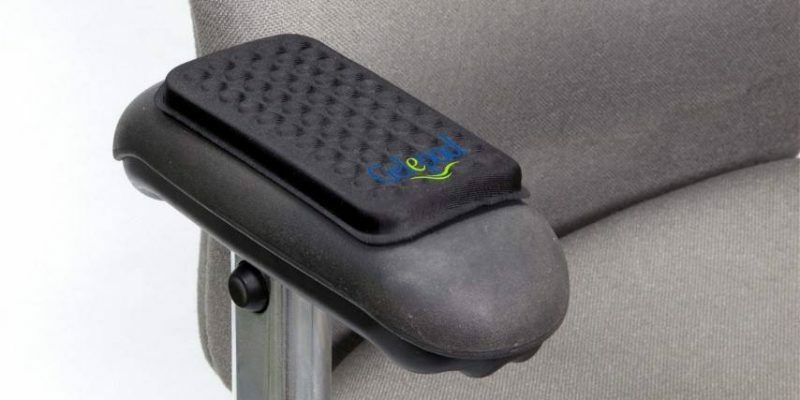 If you work standing, or in a chair without arms, you might use the Gelepad as a palm rest or arm rest on your desk directly. Or, you might use it somewhere other than your desk. For example, do you get sore spots on your elbows while driving? Try a Gelepad for that; it just might help. That’s it! No functional critique and feature comparison here, as Gelepad has no moving parts and no comparable competitors that I know of.